Gram-positive bacteria of the genus Rhodococcus have shown an extraordinary capacity for metabolizing recalcitrant organic compounds. One hindrance to the full exploitation of Rhodococcus is the dearth of genetic tools available for strain manipulation. To address this issue, we sought to develop a plasmid-based system for genetic manipulation of a variety of Rhodococcus strains. We isolated and sequenced pB264, a 4,970 bp cryptic plasmid from Rhodococcus sp. B264-1 with features of a theta-type replication mechanism. pB264 was nearly identical to pKA22, a previously sequenced but uncharacterized cryptic plasmid. Derivatives of pB264 replicate in a diverse range of Rhodococcus species, showing that this plasmid does not bear the same host range restrictions that have been exhibited by other theta replicating plasmids. Replication or maintenance of pB264 is inhibited at 37°C, making pB264 useful as a suicide vector for genetic manipulation of Rhodococcus. A series of deletions revealed that ca. 1.3 kb from pB264 was sufficient to support replication and stable inheritance of the plasmid. This region includes two open reading frames that encode functions (RepAB) that can support replication of pB264 derivatives in trans. Rhodococcus sp. B264-1 will mobilize pB264 into other Rhodococcus species via conjugation, making it possible to genetically modify bacterial strains that are otherwise difficult to transform. The cis-acting element (oriT) required for conjugal transfer of pB264 resides within a ca. 0.7 kb region that is distinct from the regions responsible for replication. Shuttle vectors derived from pB264 will be useful for genetic studies and strain improvement in Rhodococcus, and will also be useful for studying the processes of theta replication and conjugal transfer among actinomycetes. Gram-positive bacteria of the genus Rhodococcus have shown an extraordinary capacity for metabolizing recalcitrant organic compounds. Due to these diverse enzymatic activities and a demonstrated solvent tolerance, rhodococci have many practical applications for bioconversion and bioremediation (reviewed in [1, 2]). One hindrance to the full exploitation of Rhodococcus is the dearth of genetic tools available for strain manipulation. Among the most basic of tools for genetic manipulation of bacteria are plasmids. Plasmids can be used to introduce new or extra copies of genes into bacterial cells and to complement mutations in bacteria. They can be used to manipulate expression levels of different gene products, impacting a variety of cellular processes. Plasmids can also be used to deliver transposable elements or as intermediates in knocking out gene function via homologous recombination. Plasmids also play an important role in horizontal gene transfer among bacteria. The lack of plasmid vectors suitable for use in Rhodococcus has led several groups to develop binary vectors, in which an extant Rhodococcus plasmid is combined with an Escherichia coli plasmid forming a new vector that replicates in both cell types. A limited number of shuttle vectors have been developed for Rhodococcus based on this principle [3–12]. Working with two environmental isolates of Rhodococcus (the I24 and B264-1 strains; ) and with the cooperation of other laboratories, we tested a number of the available Rhodococcus/E. coli shuttle vectors, but we were unable to generate transformants with the majority of these. This and other evidence [7, 11] suggested that the rather narrow host ranges of the currently known shuttle vectors limits their use to only a few Rhodococcus species. To overcome this problem we sought to develop a new plasmid vector specifically for working with a variety of Rhodococcus strains. In this report, we describe a small plasmid, pB264, from Rhodococcus sp. B264-1 that can replicate in diverse Rhodococcus strains. pB264 can be transferred via conjugation from its normal host to other strains of Rhodococcus, and maintenance of pB264 is hindered at temperatures above 35°C. These features make pB264 a valuable tool for genetic manipulation of Rhodococcus and for studying processes of plasmid maintenance and horizontal gene transfer in this genus. In an effort to develop plasmids for genetic manipulation of rhodococci, we examined a number of Rhodococcus strains for the presence of small, cryptic plasmids. Agarose gel electrophoresis of DNA isolated from the B264-1 strain revealed a ca. 5 kb plasmid, which we labeled pB264. Whereas neither Eco RI nor Hin dIII were able to cut this plasmid, digestion with Bam HI produced three bands of ca. 3 kb, 1.5 kb and 0.4 kb (Figure 1A). A sample of the undigested pB264 was isolated from an agarose gel via GeneClean. Isolation of circular DNA by this method produces a small amount of sheared material. We purified the sheared material from a second agarose gel, treated the DNA with Klenow fragment of DNA polymerase, and ligated the products into pCR-Script, producing pAL220. Sequencing of pAL220 revealed an insert of 4970 bp (GenBank accession AY297818). FramePlot analysis  of the pB264 element revealed several ORFs. The two largest of these were ORF6 (729 nt) and ORF7 (933 nt). BLAST analysis  of this sequence revealed that pB264 is nearly identical to pKA22, a plasmid isolated from R. rhodochrous NCIMB13064, which was sequenced but not further characterized . The sole exceptions to this alignment were a thymidine substitution at nt position 17 of pB264 (corresponding to the cytosine residue at nt position 3143 of pKA22) and a thymidine insertion at nt position 37 of pB264 (corresponding to a position between nt 3162 and 3163 of pKA22.) ORFs 6 and 7 of pB264 correspond to ORFs 1 and 2 of pKA22, respectively. Analysis of genomic DNA from Rhodococcus sp. B264-1. (A) pB264 can be observed among total genomic DNA from Rhodococcus sp. B264-1. U, undigested genomic DNA (and RNA); E, Eco RI digest of genomic DNA; H, Hind III digest of genomic DNA; B, Bam HI digest of genomic DNA; M, Bst EII digest of lambda DNA. (B) Pulsed field gel electrophoresis of DNA from Rhodococcus. L, lambda ladder (~50 kb) molecular weight marker; B, genomic DNA from Rhodococcus sp. B264-1. In addition to the chromosomal DNA, which migrates near the top of the marker DNA, two additional bands can be seen in the 250–300 kb range. Additional material migrates at less then 50 kb, although resolution of the gel in this size range is not reliable under the conditions used; S, genomic DNA from R. erythropolis SQ1. For both panels, the sizes of key molecular weight markers are indicated in kb. To test whether pB264 derivatives could be used as gene expression vectors, we sought to determine whether this plasmid could replicate in other Rhodococcus strains. Since ampicillin resistance is unsuitable for selection in Rhodococcus, we introduced additional markers for KanR, TsrR or GntR into pAL220, creating the plasmids pAL224, pAL231 or pAL298, respectively. Electroporation of these plasmids into strains B264-1, I24 or R. erythropolis SQ1 produced antibiotic resistant colonies. (Because the I24 strain has a high incidence of spontaneous resistance to kanamycin, pAL224 was not used to test replication in I24.) Unrearranged plasmids could be recovered from these transformants, indicating that each plasmid could replicate autonomously in these strains and that the pB264 element could support replication. The ColE1 replicon of pCR-Script itself does not appear to support replication in Rhodococcus as we have never been able to recover antibiotic resistant colonies when ColE1-derived plasmids were used to transform B264-1 or I24, regardless of the selectable marker (see also the deletion analysis of pB264, below). The genetic diversity represented by these three strains among rhodococci (as described in ) suggests that pB264 derivatives should be able to replicate in a wide variety of Rhodococcus isolates. While Rhodococcus strain I24 can grow at temperatures above 40°C, the B264-1 strain does not grow significantly above about 32°C (unpublished observations). To test whether replication of pB264 had a similar temperature limitation as its host bacterium, we introduced pAL298 (Figure 2) into the I24 strain via electroporation. I24(pAL298) was grown in 10 ml LB + gentamicin (10 mg/l) for 2 days at 30°C. 10 μl from this culture were diluted into six separate tubes, each containing 10 ml fresh LB without antibiotics. Three of these cultures were then incubated at 30°C, while the other three were incubated at 37°C. After two days, serial dilutions were prepared from each of these cultures and plated onto LB agar or LB agar supplemented with gentamicin. These plates were then incubated for three days at 30°C to determine the proportion of bacteria that had retained the plasmid in each case. Results from these experiments are shown in Table 2. From the cultures that had been grown at 30°C, similar numbers of CFU were recovered on both the LB plates and the LB + gentamicin plates, indicating that pAL298 was well maintained in the I24 strain at 30°C, despite the lack of antibiotic selection. In contrast, from the cultures that had been grown at 37°C, fewer than 0.06% of the CFU retained the antibiotic resistance markers, indicating that replication or maintenance of the plasmid was hindered at the higher temperature. This trend was observed with other derivatives of pB264 as well, regardless of the selectable marker employed (not shown). Key plasmids used in this study. pB264 is depicted as it occurs in Rhodococcus sp. B264-1. pAL298 is a binary plasmid that carries both pB264 (indicated in yellow) and a ColEI-origin of replication, as well as GntR (aacC1) and AmpR markers. The ColEI origin does not by itself support replication in Rhodococcus sp. strains B264-1 or I24 (not shown). pJANET, contains the bulk of pB264 in conjunction with a GntR marker and an origin of replication derived from pNG2 . Note that the pNG2 origin replicates well in both E. coli and Rhodococcus and that it functions well at both 30°C and 37°C. The relative positions and strandedness of each of the 9 ORFs within pB264 are indicated as heavy blue lines. Key plasmids and strains used in this study. Colonies (CFU per ml) recovered from temperature sensitivity tests of pB264 derivative. In additional experiments, individuals were recovered from the few antibiotic resistant colonies that arose on the antibiotic plate (incubated at 30°C) from a culture that had been grown at 37°C. Each of these colonies was streaked onto two fresh LB plates supplemented with antibiotics. One plate from each set was incubated at 30°C, while the other was incubated at 37°C for two days. Of the 20 colonies tested in this manner, none grew well at 37°C, while all formed robust colonies at 30°C. This indicates that the few colonies that had retained the plasmids while the cells were growing at 37°C were not the result of mutations that allowed replication at the higher temperature. More likely, these colonies represent the minority of the cells that retained a single copy of the poorly replicating plasmids during cell division at the higher temperature. To identify the region within pB264 that is responsible for replication in Rhodococcus, we prepared a series of deletion derivatives of the plasmid pAL298. These deletions are depicted schematically in Figure 3. The plasmid pAL298 contains the entire pB264 element, the ColEI origin, which does not by itself support replication in Rhodococcus sp. strains B264-1 or I24 (not shown), and a GntR marker. Deletion derivatives of pB264 used to identify domains involved (A and B) replication and (C) conjugal transfer. The linear representation of the pB264 element indicates relative positions of the restriction sites for Xho I (X), Sac II (Sc), and Sph I (Sp), as well as the positions and orientations of ORFs 1 through 9. (A) Deletion derivatives of pB264 that retain the ability to replicate in Rhodococcus. The entire pB264 element is represented in the plasmid pAL298. For this plasmid and all derivatives of pAL298, only the portions derived from pB264 are shown (as black boxes), while deleted regions are represented as dotted lines. Note that in plasmid 2 (and all derivatives of plasmid 2), the region bounded by the two Sac II sites denoted by asterisks (*) was inverted during plasmid construction. Plasmids 1–8 could all be propagated by themselves in Rhodococcus sp. I24. Plasmid 9, however, could only be maintained in Rhodococcus sp. I24 when either pAL312 or pAL314 were present. Plasmids 10 and 11 could only be maintained in Rhodococcus sp. I24 when pAL314 was present. (B) Regions of pB264 supplied in trans to support replication of plasmids 9, 10, and 11. (C) Deletion derivatives of pB264 that retain the origin of conjugal transfer. Plasmid 16 (pJANET) contains the bulk of the pB264 element, lacking only a 136 bp fragment at the 5' end. While pAL281 can not be transferred from Rhodococcus sp. B264-1 to other rhodococci via conjugation, plasmids 15 through 20 are readily transferred. Dozens of deletion derivatives were prepared from pAL298. These were first propagated in E. coli to recover a large amount of purified plasmid. Individual deletion derivatives were then introduced into Rhodococcus sp. I24 via electroporation. Rhodococcus sp. I24 was used as the host in these experiments, rather than Rhodococcus sp. B264-1 to decrease the possibility that some gene product in the host strain might be supporting plasmid replication in trans or via recombination with the native copy of pB264, which might confound the results. Following electroporation, cells were plated onto LB supplemented with gentamicin and incubated for 2–3 days at 30°C to identify transformants. Colonies from these plates were inoculated into 10 ml of LB supplemented with gentamicin and grown for 2–3 days at 30°C. Total genomic DNA was recovered from each of these and examined for the presence of the intended plasmid either by direct restriction enzyme digest and agarose gel analysis or by the "retransformation" method (see Methods). These tests were necessary to confirm that GntR had not arisen spontaneously nor by recombination of the plasmids into the I24 genome. The majority of deletion derivatives tested failed to produce colonies of transformed Rhodococcus sp. I24. Those capable of replicating in the I24 strain are depicted in Figure 3. 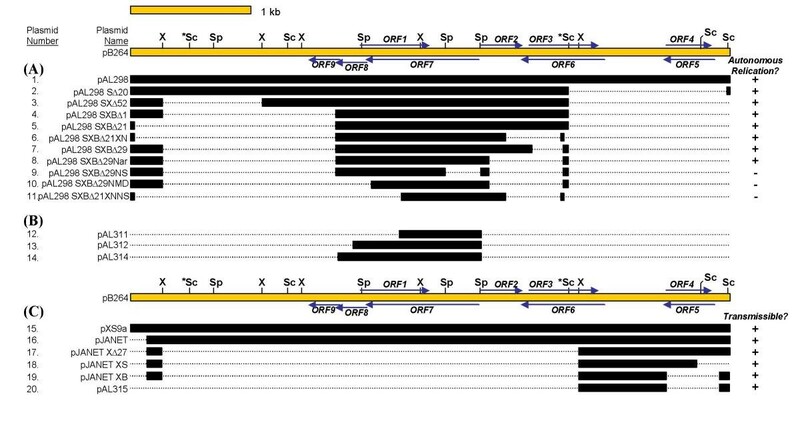 Examining the regions retained in plasmids 1–8 (Figure 3) strongly suggests a role for the ORF7 and ORF8 gene products in replication of pB264. To test this hypothesis more directly, a 280 bp Sph I fragment was deleted from the 5' end of ORF7 (corresponding to the N-terminus of the encoded protein), creating plasmid 9 (Figure 3). We were unable to obtain transformed colonies when electroporating plasmid 9 into Rhodococcus sp. I24, even though parallel electroporations of plasmid 8 were always successful. These results suggested that plasmid 9 had lost the ability to replicate autonomously in Rhodococcus. In contrast, when the gene product of ORF7 was supplied in trans, plasmid 9 could replicate in the I24 strain. This was accomplished by preparing plasmid 13 (pAL312), which can replicate in Rhodococcus sp. I24 because of the NG2 origin it possesses. ORF7 is positioned downstream of a constitutive promoter in this plasmid. pAL312 was introduced into the I24 strain, and competent cells were prepared from the transformant. Subsequently, plasmid 9 was introduced into I24(pAL312) by electroporation. Recovery of both plasmid 9 and pAL312 from the resulting transformants confirmed that each was replicating separately and that plasmid 9 was not being supported because of some recombination event. In contrast, plasmid 12, which expresses a truncated version of ORF7, was unable to support replication of plasmid 9, further confirming the role of the ORF7 gene product. In a similar series of experiments the region carrying ORF8 was deleted from either plasmid 8 or plasmid 6, creating plasmids 10 and 11, respectively. Neither of these plasmids produced colonies when electroporated into Rhodococcus sp. I24, unless that host was already carrying pAL314, which expresses both ORF7 and ORF8. Replication of plasmids 10 and 11 could not be complemented in trans by pAL312, indicating that ORF8 is required for replication. These results also indicate that all of the cis-acting elements required for plasmid maintenance (such as oriV) reside within the portions of pB264 that were retained in both plasmid 9 and plasmid 11, most likely within the 139 bp region that was retained immediately upstream of ORF7. While it seems likely that other elements may reside on pB264, such as copy number control elements, partitioning functions or plasmid addiction systems , we found that the smallest deletion derivative of pAL298 (plasmid 8, Figure 3) was maintained as stably as pAL298 (if not more so) by Rhodococcus sp. I24 cells in both the presence and the absence of antibiotic selection (data not shown). PFGE analysis of the Rhodococcus sp. B264-1 revealed the presence of at least two megaplasmids in the 250–300 kb size range (Figure 1B). Megaplasmids have often been implicated in conjugal transfer of DNAs between bacterial cells. In many cases, these large extrachromosomal elements have been found to encode the functions (especially the trans acting components) necessary to physically conduct the DNA from the donor to the recipient cell. The presence of such elements in the B264-1 strain suggests the possibility that this strain can promote conjugal transfer of DNAs between cells. In other systems, small plasmids have been found  or created ; ) that can also be transferred conjugally, though these small elements do not themselves encode the full complement of trans-acting functions required for transfer. To test whether the plasmid pB264 could be mobilized from Rhodococcus sp. B264-1 into other Rhodococcus strains, we constructed the plasmid pXS9a, which carries the entire pB264 element, an E. coli origin of replication, and three selectable markers (KanR and TsrR for selection in Rhodococcus, and AmpR for selection in E. coli). This plasmid was introduced into the B264-1 strain via electroporation, and the presence of the unrearranged plasmid confirmed. (Examining plasmid DNA from these transformants revealed that establishment of pXS9a was accompanied by the loss of the native pB264, suggesting incompatibility of the two plasmids.) B264-1 (as a negative control) or B264-1(pXS9a) were then co-cultivated with prospective recipient strains as described in Methods. Following co-incubation, the cell mixtures were transferred to selective plates containing rifampicin (to select against the donor strain) and thiostrepton and kanamycin (to select for the plasmid) and incubated at 30°C. When R. erythropolis SQ1 or Rhodococcus sp. I24 R6 were used as recipients in these experiments, RifR, TsrR and KanR colonies were recovered that could easily be distinguished from the donor strain based on colony color and morphology. When plasmid DNA was isolated from these putative transconjugants, each was found to carry pXS9a, unrearranged (data not shown). Transconjugants were also recovered when B264-1 R1 was used as a recipient strain. In contrast, no RifR, TsrR and KanR colonies were recovered in these experiments when recipient cultures were co-incubated with untransformed donors (B264-1), heat-treated donors [B264-1(pXS9a) incubated at 65°C for 20 minutes], filtered supernatants from B264-1(pXS9a) cultures, or naked pXS9a plasmid DNA. These results indicate that the pB264 derivative pXS9a can be transferred conjugally from Rhodococcus sp. B264-1 to other Rhodococcus strains. We have used conjugation to successfully transfer other pB264 derivatives from Rhodococcus sp. B264-1 to a variety of other Rhodococcus strains, including an environmental isolate of R. erythropolis that is distinct from the SQ1 strain, and three other environmental isolates of R. ruber, R, rhodochrous and R. fasciens. Given that the Rhodococcus sp. I24 strain can grow at higher temperatures than can the B264-1 donor strain, we sought to exploit temperature as a selective agent in such conjugation experiments. To accomplish this, we first needed a version of the pB264 plasmid that could replicate stably at the elevated temperature. Rather than identifying a mutant pB264 with this property, we chose to simply add a second, temperature stable origin of replication to the pB264 element, creating the plasmid pJANET (Figure 2; the NG2 origin from Corynebacterium diphtheriae replicates in both E. coli  and Rhodococcus, and is stable at 37°C). We found that growth at 37°C (in conjunction with gentamicin) is very effective for selecting transconjugants when the donor is B264-1(pJANET) and the recipients are the I24 strain or other Rhodococcus strains that grow at 37°C. To estimate the efficiency of transfer, conjugations were carried out between B264-1(pJANET) and the I24 strain. Following co-incubation of the donor and recipient strain (prior to the selection step), serial dilutions were prepared from the cell mixture. Portions from these dilutions were plated onto either LB agar or LB agar supplemented with gentamicin, and these plates were treated in three different ways (Table 3). (1) Incubating the LB gentamicin plates at 37°C, conditions that only permit growth of I24(pJANET), we were able to identify the total number of transconjugants per experiment. (2) Incubating the LB gentamicin plates at 30°C, we were able to calculate the total number of donor cells [B264-1(pJANET)] used in each experiment. Under these conditions, both donors and transconjugants would be able to grow. However, the transconjugants have an easily distinguishable phenotype (color) and the total number of donors greatly exceed the total number of transconjugants, so it was a simple matter to determine which colonies were derived from donor or recipient cells. (3) From LB plates (no antibiotic) grown at 37°C, we were able to determine the total number of recipient cells used in the experiment. Under these conditions, no donors can grow, but all recipients can grow, regardless of whether they have acquired the antibiotic resistance marker. From six replicates of this experiment, representing 2 sets of donor and recipient cultures, three independent matings each, and then serial dilutions prepared from each of these matings, we calculated that 1 transconjugant was generated per 1.11 ± 0.28 × 105 donors. This corresponds to 1 transconjugant per 1.37 ± 0.36 × 106 recipients. Frequency of conjugal transfer of pB264 derivatives from Rhodococcus sp. B264-1 to Rhodococcus sp. I24. a Several of the transconjugants were subsequently tested, and the presence of unrecombined pJANET was confirmed in each of these I24 derivatives. Trans-acting elements are likely to play an important role in the conjugal transfer of the plasmid from B264-1 to other Rhodococcus strains. Given the size of pB264 and the presence of megaplasmids in the B264-1 strain, it is entirely possible that none of the required trans-acting factors are encoded by pB264. However, it is almost certain that a specific cis-acting element (an origin of transfer or oriT) resides on pB264. To determine what portion of pB264 enables conjugal transfer in cis, we prepared a series of deletions in pJANET and tested each for the ability to be transferred in conjugations between the B264-1 donor and an I24 recipient (using growth at 37°C and gentamicin for selection of transconjugants). We were unable to recover transconjugants with the majority of deletion derivatives tested in this manner, including pAL281, which is related to pJANET but lacks the entire pB264 element. B264-1 donors carrying the plasmids pJANET XΔ27 (plasmid 17 of Figure 3), pJANET XS (plasmid 18), pJANET XB (plasmid 19), or pAL315 (plasmid 20) produced transconjugants at frequencies similar to B264-1(pJANET). In all cases, transconjugants were tested further and found to have taken up the unaltered test plasmids (not shown). Sequences in common between the smallest of these plasmids, pJANET XS and pAL315, correspond to a region of 743 bp from pB264 (Figure 3) that is apparently devoid of ORFs. The complete nucleotide sequence of the small, cryptic plasmid pB264 (4970 bp) of Rhodococcus sp. B264-1 was determined. The G+C content of the sequence of this plasmid is 64.8 mol%. pB264 proved to be identical to the largely uncharacterized cryptic plasmid pKA22 isolated from R. rhodochrous NCIMB13064 by Kulakov et al. . The translational product of ORF7 (corresponding to ORF2 of Kulakov et al., ) consists of 296 amino acids with an estimated molecular mass of approximately 33 KDa, whereas the 82 amino acid translation product of ORF8 has a predicted mass of approximately 9.2 KDa. BLAST analysis  of ORF7 and ORF8 identified several additional database entries with greater than 50% of amino acid identity to the predicted gene product (not shown). These include the two components of a putative theta replicase (repA, encoding a putative primase, and repB, encoding a putative DNA binding protein) from Brevibacterium linens plasmid pLIN , as well as putative proteins encoded by the Mycobacterium fortuitum plasmid pAL5000 [24, 25] and relatives of this plasmid. These homologies suggest that the pB264 replicon belongs to the pAL5000 family of Gram-positive theta replicating plasmids, a group that includes plasmids that have been isolated from Bifidobacterium, Brevibacterium, Corynebacterium, Mycobacterium, and Neisseria . Furthermore, the deduced amino acid sequence of ORF7 contains the characteristic helix-turn-helix motif of DNA binding proteins (data not shown). The presence of two major motifs within the RepA protein of pB264  that are characteristic of theta replicating plasmids  provides additional evidence that pB264 uses a theta mode of replication. Our deletion analysis of pB264 provides strong evidence that ORF7 and ORF8 are required for plasmid replication, supporting the designation of these ORFs as repA and repB. Further supporting this assertion is the observation that expression of repA and repB in trans supports replication of pB264 derivatives that lack either or both of these elements (Figure 3). The RepA and RepB proteins of other plasmids from the pAL5000  and ColE2  families have also been shown to function in trans. The majority of small plasmids isolated from Gram-positive organisms are believed to replicate via a rolling circle mechanism, where the leading DNA strand is first synthesized from a starting nic site and then used as a template for production of the lagging strand. Unfortunately, many vectors based on RC origins of replication exhibit structural and/or segregational instability that is not observed in plasmids that employ a theta mode of replication [29, 30]. This instability appears to be exacerbated by the insertion of foreign DNA fragments. The observed instability of RC plasmids has been attributed to formation of single stranded DNA intermediates, which may result in deletions due to illegitimate recombination [31, 32]. Additionally, it has been proposed that the formation of high molecular mass multimers provides a selection against recombinant plasmids, thereby also encouraging the enrichment of deletion derivatives . The segregational instability of RC based plasmids containing cloned DNA sequences has similarly been attributed to this selection disadvantage . Rhodococcus has proven particularly refractile to gene cloning using such RC based vectors. By exploiting the theta-mode replication functions of pB264, shuttle vectors constructed will avoid the segregational and structural instability problems inherent to RC replicons. Our experience with pB264 derivatives supports this assertion. The observation that replication or maintenance of pB264 is affected by the temperature at which the host cell is grown is reminiscent of the plasmid pSG5. Muth et al. discovered pSG5, a rolling circle type plasmid, in an isolate of Streptomyces ghanaensis. This isolate had a limited tolerance for elevated temperatures and could not grow above 35°C. While pSG5 derivatives could replicate in other Streptomyces isolates, it could do so only at lower temperatures (≤ 34°C). Even though some of these strains could grow above 35°C they could not retain the plasmid at this higher temperature. In the present experiments, the Rhodococcus sp. B264-1 strain cannot grow at 37°C while the I24 strain can. Although pB264 could replicate in both strains, it was rapidly lost from the I24 strain when that host was grown at 37°C (Table 2). Three classes of theta replicating plasmids, designated A, B, and C, have been defined in the literature . These classes differ with respect to their structural features and are based almost exclusively on studies of Gram-negative bacteria. Theta replicating plasmids from Gram-positive bacteria have not yet been extensively studied, but most appear to fall into one of the first two classes [29, 30]. Gram-positive theta replicons, such as pAMβ1, have been identified that do not appear to fit into these established classes . Similarly, pB264 does not appear to fit easily into these theta classifications. The basic replicon of pB264 encodes RepA and RepB proteins essential for replication and does not appear to carry an oriA-like structure , which sets pB264 apart from the previously described Rep-dependent class A plasmids. Similarly, several features distinguish pB264 and class B replication. First, class B replicons do not encode Rep proteins, whereas pB264 does. Second, there is no homology between the pB264 replicon and the highly conserved ca. 600 nt elements that are characteristic of class B plasmids. Third, pB264 can replicate in at least three diverse species of Rhodococcus, while class B plasmids characteristically have a narrow host range. The pAL5000 family of replicons , and specifically pB264, superficially resemble class C replicons , consisting almost entirely of the E. coli-derived ColE2 and ColE3 (reviewed in ). Class C plasmids encode Rep proteins and do not require an oriA-like structure for replication. However, the homology between the replication regions of pB264 (or other pAL5000-type plasmids) and the class C plasmids is, at best, highly diverged . Furthermore, there is no significant homology between the Rep proteins of the pAL5000-type plasmids and ColE2. We, therefore, believe that pB264, and by extension the pAL5000 family of replicons, belongs to a separate class of theta replicating plasmids. Further work is required to determine how widespread this class is and what its relation is (if any) to the previously described class C replicons. While replication functions in pAL5000 have been extensively studied, our results with pB264 suggest that this plasmid is part of a distinct sub-group. Experimental evidence has shown replication of pAL5000 to be dependent on several sequence domains immediately upstream of the repAB promoter [25, 40]. The "L-site" is a low affinity Rep binding site where replication initiates. The "H-site" contains GC-rich and AT-rich 8 bp palindromes, as well as two short, inverted repeats. Mutations within these structures interfered with binding of RepB as well as replication. pB264 contains no structures that resemble either the L-site or the H-site. However, pB264 does possess two AT-enriched domains, comprising DR2 ; Figure 4). Within this domain is a sequence that is highly conserved among pAL5000 and its relatives , although it has not been shown directly that the conserved element is required for replication of pAL5000. The smallest autonomously replicating derivative of pB264 (Figure 3) retains only one of the two repeat elements within DR2. Chattoraj  described a scenario in which two components of a direct repeat enabled copy number control, whereas only one copy was required for plasmid replication. Summary of structural elements within regions of pB264 involved in replication and conjugal transfer. (A) Schematic representation of pB264, showing relative positions of restriction sites (as in Figure 3), as well as the positions and relative orientations of nine open reading frames (long arrows) and several repeat elements (small arrowheads). ORFs for which a function has been demonstrated are indicated in darker blue. Numbering of the repeat elements is as defined by Kulakov et al. . Numbers in italics indicate single copies of inverted repeat elements, while the paired elements within the direct repeats are indicated by a single label (DR1 or DR2). Below the diagram of pB264 are schematic representations of the regions involved in replication of pB264 [defined as the intersection of the two smallest autonomously replicating plasmids (plasmids 6 and 8) described in Figure 3] and conjugation of pB264 [defined as the intersection of the two smallest conjugative plasmids (18 and 20) described in Figure 3]. Note that only 9 of the 14 nt comprising one copy of inverted repeat 2 are retained within the replication region (far left). (B) Sequence detail of the region near DR1. The direct repeat is composed of two 30 nt elements (DR1a and DR1b) indicated in uppercase letters. This region also possesses four smaller (16 nt) direct repeat elements, indicated by arrows above the sequence. (C) Sequence detail in the region of DR2. The two repeat elements that comprise DR2 (DR2a and DR2b) are indicated in uppercase letters. A sequence element that is conserved among pAL5000-type plasmids is nested within the repeat elements (underlined). Note that the smallest autonomously replicating plasmid bears only DR2a and a single copy of the pAL5000 element and extends only to the position marked "deletion terminus." Bacterial conjugation is a specialized gene transfer process that involves unidirectional transfer of DNA from donor to recipient bacteria by a mechanism that requires cell-to-cell contact. Plasmids spread both within and between bacterial species primarily through conjugal transfer. Plasmids are classified according to their conjugative ability as conjugative (auto-transmissible), mobilizable (transmissible only in the presence of a helper conjugative plasmid), or non-mobilizable. Conjugative plasmids contain the necessary genetic information to catalyze conjugative DNA processing and DNA transport. Mobilizable plasmids lack part of this machinery. Naturally occurring mobilizable plasmids contain oriT, the only DNA sequence required in cis for conjugation, and they may encode a set of proteins to process oriT and make it available to the transport complex. Plasmid pB264 and genetically labeled derivatives could be transferred to different Rhodococcus strains by conjugation, showing that pB264 is a mobilizable plasmid. Experiments with filtered culture supernatants, heat-treated donor cultures and naked DNA distinguished conjugal transfer from other possible modes of DNA transfer such as phage-mediated or direct DNA uptake. A region involved in mobilization of pB264 was identified that is distinct from the regions involved in replication. This region includes both inverted repeats (IR8) and direct repeats (DR1) that may serve as the oriT sequence (Figure 4). Others have proposed that such repeat elements play a role in conjugal plasmid transfer . Currently, pB264 remains cryptic as no function, other than replication and mobilization functions, has been attributed to this plasmid. None of the predicted open reading frames, other than the designated repA and repB, show significant homology to any functionally defined sequence. In R. rhodochrous NCIMB13064, the pB264 homolog, pKA22, appeared to segregate with the loss of the ability to utilize short chain 1-chloroalkanes and the appearance of a naphthalene degrading phenotype, in that reversion to wild type phenotype appeared to correlate with disappearance of the cryptic plasmid . This association, however, is more likely attributed to the effects of plasmid integration into the chromosome rather than an explicit, plasmid encoded function. The plasmid pB264 has several properties that make it useful for genetic manipulation of rhodococci. First, it replicates in diverse Rhodococcus hosts. Second, it can be easily transferred via conjugation from the B264-1 host to other strains. This property becomes especially valuable when working with strains of Rhodococcus that are not amenable to direct transformation (e.g. via electroporation). Third, pB264 is temperature sensitive. Combining the conjugability of the plasmid with its temperature sensitivity, pB264 can be employed as a suicide vector for introducing elements such as transposons  into the chromosome of recipient strains. We have exploited these properties to create several gene knockouts via homologous recombination in Rhodococcus (manuscript in preparation). While the conjugability of pB264 is useful in the above applications, this plasmid also provides an important resource for studying the processes of plasmid replication and horizontal gene transfer among Rhodococcus spp. Restriction enzymes, Klenow fragment of DNA polymerase and molecular weight markers were purchased from New England Biolabs (Beverly, MA) and used as specified by the manufacturer. The pCR-Script cloning kit was purchased from Stratagene (La Jolla, CA) and the GeneClean II kit was purchased from Bio101 (Vista, CA), and both were used according to the manufacturers' guidelines. DNA sequencing of pB264 was carried out initially by Lark Technologies (Houston, TX), while ambiguities were resolved and additional sequencing was carried out at the MIT Biopolymers Lab using Applied Biosystems BigDye Terminator cycle sequencing reagents (Applied Biosystems, Foster City, CA). Large scale plasmid purification from E. coli cultures were carried out using the Wizard Plus Maxiprep kit (Promega, Madison, WI). Principal strains and plasmids used in this study are described in Table 1. The B264-1 R1 strain of Rhodococcus was isolated by plating a culture of Rhodococcus sp. B264-1 that had been grown in Luria-Bertani (LB) medium;  onto LB 2% agar supplemented with 20 mg/l rifampicin. One of the RifR colonies that arose was designated B264-1 RI, and was found to be morphologically indistinguishable from the wild-type strain. Rhodococcus sp. I24 R6 was generated by treating an I24 culture with ethylmethanesulfonate by the method of Eisenstadt et al  and selecting for growth on LB 2% agar supplemented with 20 mg/l rifampicin. One of the resulting colonies, all of which were morphologically indistinguishable from the wild-type I24 strain, was designated I24 R6. Deletions were carried out as follows: Partial digestion of plasmid 1 with Sac II followed by religation of the products generated plasmid 2. Partial digest of plasmid 2 with Xho I produced plasmid 3. Partial digest of plasmid 3 with Bsa HI produced plasmid 4. 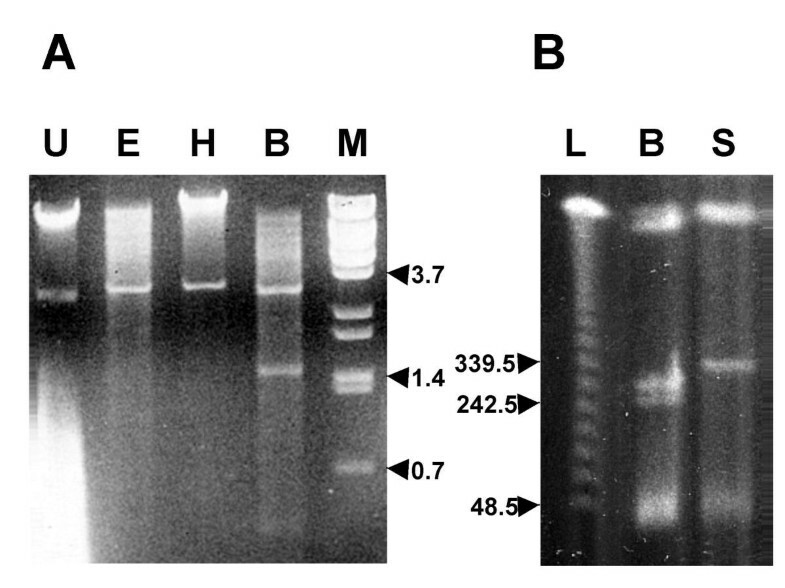 Plasmids 5 and 7 were both derived from partial digest of plasmid 4 with Bsa HI. Plasmid 6 was prepared by complete digestion of plasmid 5 with Xmn I and partial digestion with Nae I. Deleting the Nar I fragment from plasmid 7 produced plasmid 8. Partial digestion of plasmid 8 with Sph I generated plasmid 9. Deleting the region from an Mfe I site in the pB264 element to a Dra I site within the ColEI origin of the vector of plasmid 9 generated plasmid 10, whereas deleting a region from the Nae I site within the pB264 element to a ScaI site within the vector of plasmid 6 produced plasmid 11. Termini for these deletions were confirmed by DNA sequencing. Plasmids 12 and 13 (pAL311 and pAL312) were prepared as described below. Plasmid 14 (pAL314) was prepared by ligating an Aat II-Pvu II fragment from plasmid 8 into the Aat II and Spe I(blunted) sites of plasmid 12, which positioned both ORF7 and ORF8 downstream of the trc promoter. Plasmid 17 was prepared by a partial Xho I deletion of plasmid 15. Plasmids 18 and 19 were created by Sma I and partial Bsa HI deletion of plasmid 17, respectively. Plasmid 20 (pAL315) was prepared by ligating the Xho I-Pst I fragment from plasmid 19 into the Xho I and Pst I sites of pAL281. The plasmid pJP10 was obtained from J. Parker (MIT Dept. of Biology). This plasmid contains the NG2 origin of replication from pEP2 , the RP4 mob element from pSUP301 , a spectinomycin resistance marker derived from the omega interposon ; ), a KanR marker from pUC4K, and lacI q and the trc promoter from pTrc99A (Amersham Pharmacia, Piscataway, NJ). pJP10 also possesses a useful polylinker positioned downstream of the trc promoter. Deleting the KanR marker and the lacI q gene as a Pvu II fragment from pJP10 produced pAL307. A 0.7 kb portion of ORF7 was amplified from pB264 by polymerase chain reaction using the primers ORF7 3' (5'-GGAATTCGCTGTCATGAGTGGGCAGGT-3') and ORF7 5' (5'-CCTGCAGAAATGCCCAGGTTTCGTTCGAGA-3') and ligated into pCR2.1-TOPO using the TOPO-TA Cloning Kit (Invitrogen, Carlsbad, CA), creating the plasmid pAL308. The ORF7 fragment was then positioned downstream of the trc promoter by ligating the Pst I-Spe I fragment from pAL308 into the Pst I and Spe I sites of pAL307, to make the plasmid pAL311. pAL312 was prepared by ligating an Aat II-Sma I fragment from pAL298 SXBΔ29Nar (plasmid 8, Figure 3) into the Aat II and Spe I (blunted with the Klenow fragment of DNA polymerase I) sites of pAL311, which reconstitutes ORF7. The plasmid pAL280 carries the NG2 origin of replication and a GntR marker, as well as polylinker positioned upstream of a promoterless β-glucuronidase gene from E. coli (Priefert et al., in press ). The majority of the β-glucuronidase gene was deleted from this plasmid as a Sna BI-Xmn I fragment, leaving pAL281, which bore the polylinker, the NG2 origin and the GntR marker. pJANET (Figure 2) was created by ligating the majority of pB264 as a Pst I fragment from pAL220 into the Pst I site of pAL281. Direct transformation of bacterial strains was carried out via electroporation. Electroporation of E. coli followed the protocol described in the BioRad (Richmond, CA) Gene Pulser Manual. Electroporation of R. erythropolis SQ1 followed the protocol of Treadway et al. . A protocol developed for electroporation of Corynebacterium  was used for transformation of Rhodococcus sp. B264-1. Rhodococcus sp. I24 was prepared for electroporation as follows. 0.5 ml of a late exponential stage culture of Rhodococcus sp. I24 was added to 200 ml MB 1.5% glycine (per liter, 5 g yeast exract, 15 g BactoTryptone, 5 g BactoSoytone, 5 g NaCl, 15 g glycine; medium components from Difco, Detroit, MI), and incubated with aeration at 37°C until O.D.600 was approximately 0.25 (10–14 hours); cells from this culture were centrifuged and washed twice with 30 ml ice cold EPB1 (20 mM Hepes, 5% glycerol, pH7.2) and once with 10 ml ice cold EPB2 (5 mM Hepes, 15% glycerol, pH7.2). The final cell pellet was resuspended in ca. 1 ml of EPB2 and aliquots were stored at -80°C. 0.5–10 μg DNA was mixed with 70 μl cells and electroporated in 2 mm cuvettes with a BioRad Gene Pulser (400 Ω, 25 μFd, 2.5 kV). Cells recovered for a minimum of one hour at a suitable temperature (30–37°C, depending on the plasmid DNA involved) and were plated onto LB 2% agar with appropriate antibiotics. Following transformation of Rhodococcus cells, putative transformants were routinely tested by isolating total genomic DNA (see below), and carrying out diagnostic restriction enzyme digests. In cases where plasmids could not be easily observed on agarose gels after restriction enzyme digest (as was usually the case with Rhodococcus sp. I24 transformants), Southern blots or, more routinely, a "retransformation" strategy was employed to detect the plasmids (see below). Cells from 7 ml of late exponential culture were centrifuged, the supernatant discarded, and the cell pellet frozen (for no longer than one hour at -20°C; if pellets were to be kept for longer, they were stored at -80°C). Cells were then thawed and resuspended in 250 μl fresh 10 mg/ml lysozyme in TE (10 mM Tris-HCl, 1 mM EDTA, pH 8) and transferred to a microcentrifuge tube. 20 μl mutanolysin (1 mg/ml; Sigma, St. Louis, MO) was added, and the slurry was incubated at 37°c for 1–2 hr while gently shaking/rotating. Following this, 50 μl 0.5 M EDTA, 50 μl 10% SDS and 50 μl 5 M NaCl were added with gentle mixing, followed by addition of 10 μl proteinase K (fresh 20 mg/ml or Sigma cat. no. P4850) and incubation at 37°C for 1 hour. Subsequently, 50 μl sodium perchlorate (1 g/ml) was added to the mixture, followed by extraction with phenol:chloroform:isoamyl alcohol (25:24:1), and chloroform:isoamyl alcohol (24:1). Total DNA was then precipitated with 0.6 ml isopropanol and centrifugation. DNA pellets were washed briefly with 70% ethanol, dried and resuspended in 100–200 μl TE. Plasmids that could not be observed directly in restriction enzyme digests of total genomic DNA (for example, due to low copy number or poor recovery) from Rhodococcus could be detected readily by electroporating an aliquot (typically 1–5 μl) of the total genomic DNA into competent E. coli cells, followed by selection on LB agar with appropriate antibiotics. This procedure requires that the plasmid in question is able to replicate in E. coli and it bears a suitable selectable marker. E. coli transformants recovered from these plates were cultured and plasmid DNA recovered via a miniprep procedure (e.g., Eppendorf Perfectpreps, Hamburg, Germany) and tested via restriction enzyme digestion and analysis. Finding a plasmid to be indistinguishable from the plasmid that had originally been introduced into the Rhodococcus cells confirmed the presence of the plasmid in the candidate Rhodococcus transformant. 10 ml cultures of donor and recipient bacterial strains were cultured to late exponential stage in LB medium plus antibiotics, as appropriate. 0.5–1 ml from each donor strain was centrifuged briefly and the cell pellet was washed with 0.5 ml fresh LB (no antibiotics). The supernatant was discarded and 0.5–1 ml recipient cell culture was added to the washed donor cells and centrifuged briefly. The resulting mixed cell pellet was then resuspended in ca. 100 μl LB, and the cell slurry was dripped onto the center of a presterilized (with ethanol) mixed cellulose ester 0.2 μm filter (Millipore, Milford, MA), which lay on an LB agar plate (no antibiotic). The cell mixture was incubated overnight at 30°C, after which the cells were washed from the filter and resuspended with 0.5 ml fresh LB. Following resuspension, the cells were plated onto LB plates carrying the appropriate antibiotics and incubated for 2–8 days at 30–37°C (depending on the plasmid being transferred and the tolerance of the recipient cells) until transconjugant colonies appeared. Rhodococcus cells were embedded in low melting point agarose. Slices of embedded cells were incubated in bacterial lysis solution (10 mM Tris-HCl pH8, 50 mM NaCl, 100 mM EDTA, 0.2% sodium deoxycholate, 0.5% sarcosine, 1 mg/ml lysozyme) overnight at 37°C. Lysis buffer was replaced with digestion buffer (0.5 M EDTA, 1% sarcosine, 0.5 mg/ml proteinase K) and incubated at 50°C overnight. Slices of embedded cells were then loaded into the wells of a 1% agarose gel, 0.5X TBE (1X TBE = 0.49 M Tris-HCl, 0.49 M boric acid, 0.001 M EDTA; pH8), and run in a BioRad CHEF-DRII PFGE apparatus at 14°C and 6 v/cm for 19 hrs, with a switch time beginning at 15s and ramping to 75s. Pulsed field gels were stained with ethidium bromide before photographing. We wish to thank Jefferson Parker (MIT Department of Biology) for the gift of pJP10 and Ms. Jennie Cho for technical assistance. This research was supported in part by the Cambridge-MIT Institute and Merck Research Laboratories. PAL was involved in all aspects of this project, from conception to execution to interpretation and drafting the manuscript. XMO carried out experiments for defining the conjugal transfer functions as well as interpreting the data and drafting the manuscript. DHC carried out experiments for defining the minimal replicon. AJS was responsible for project coordination.